Yesterday Sue and Flo went shopping. They went first into the city centre, from there to a supermarket, and finally back home; a round trip of a couple of miles. 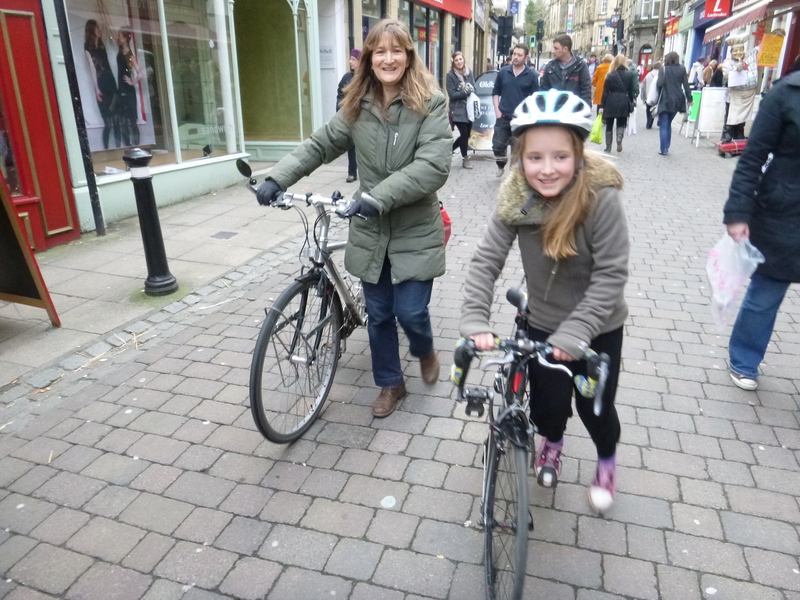 Because Sue planned to buy heavy groceries at the supermarket, she decided they’d cycle – it’s easier to let her bike carry weight, in two rear panniers, than to put it into a rucksack and onto her back. Sue pulled panniers along with a couple of locks from the bike cupboard next to our back door. She also grabbed Flo’s helmet; neither of us has a firm, fixed perspective on helmet use, so whether our kids wear helmets for a particular trip often feels like an arbitrary or intuitive decision. And we’re lucky that at least for now both of them do as they’re told! Then Sue pulled their bikes out from the sheds; Flo’s bike was in one, hers in another (we’ve quite a few bikes between us). They set off to town. Here they are about half-way there. 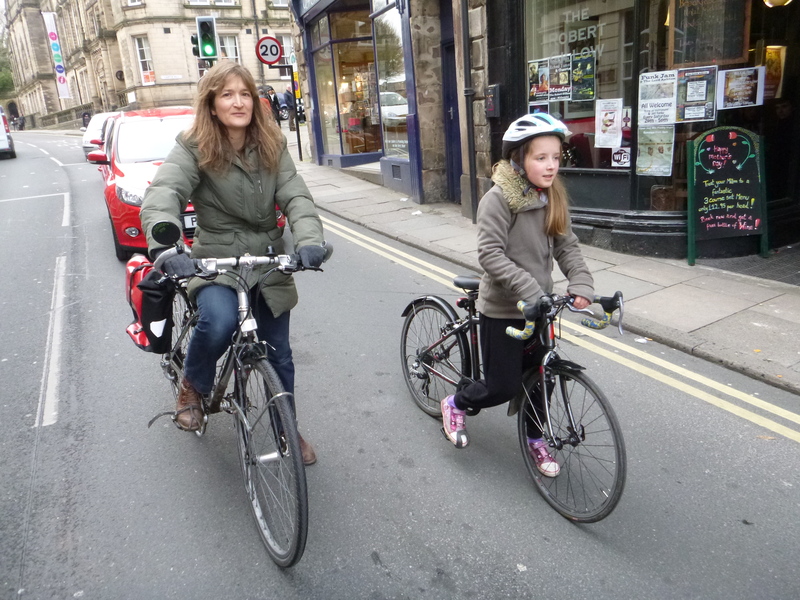 Sue rides behind and out from Flo; this is how we tend to ride with the kids, in order to slow – and shield them from – passing traffic. 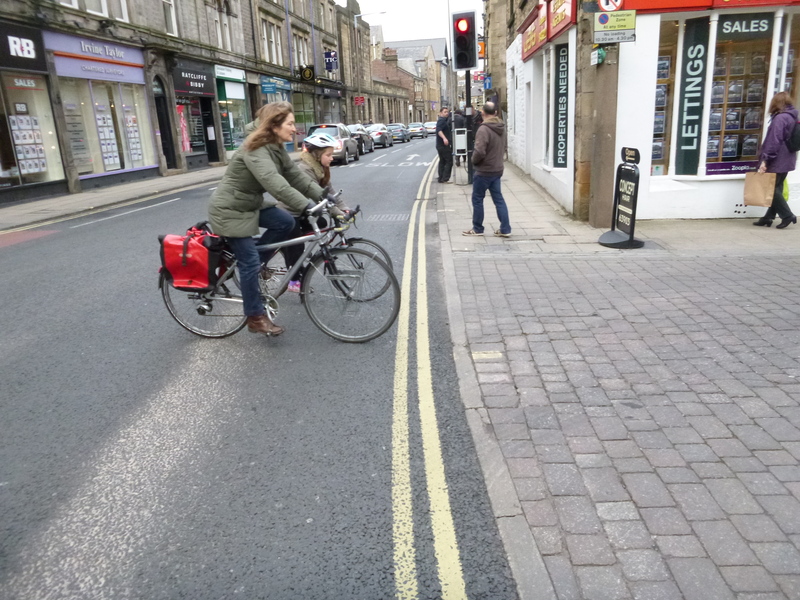 They’re stopped by the traffic lights just before reaching Lancaster’s pedestrianised zone; when the lights change they head straight into it. 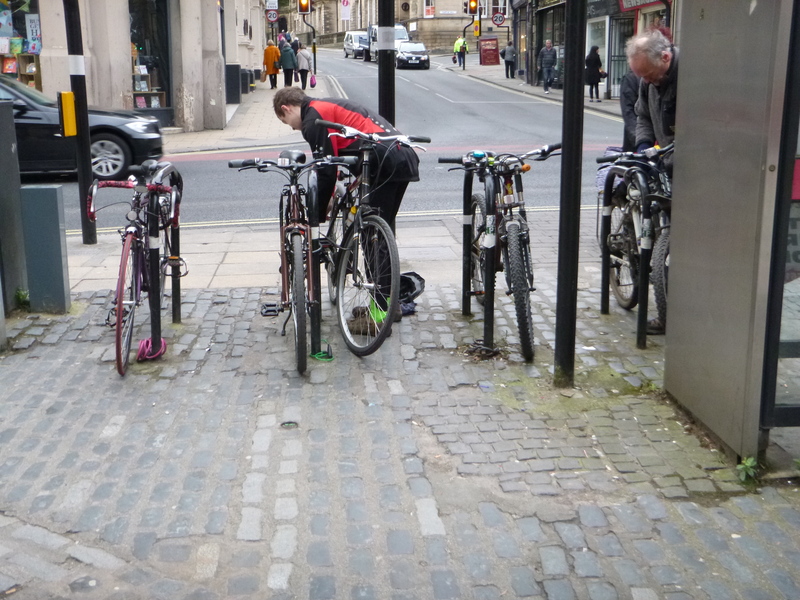 They could park their bikes here; cycle parking is sensibly located where the pedestrianized zone starts. But they plan a looped route so it makes more sense to keep their bikes with them. 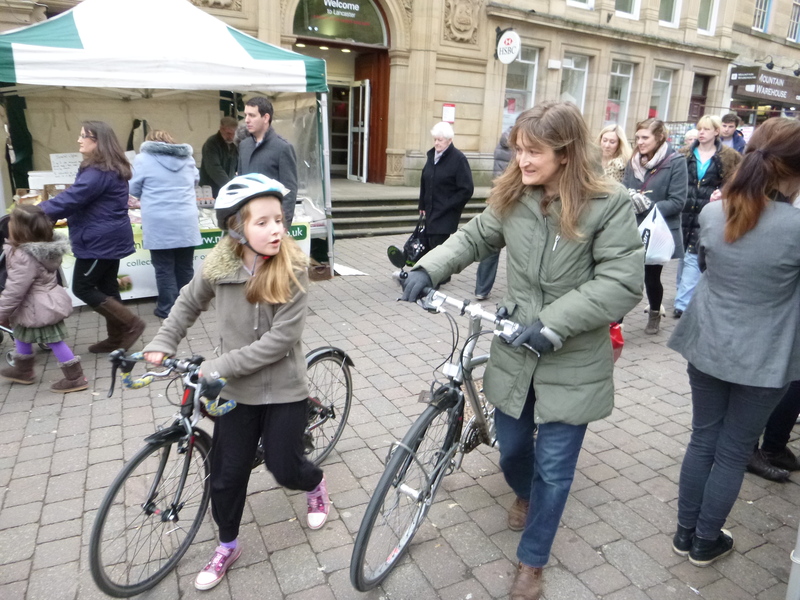 So Flo scoots and Sue pushes through the city centre, busy with shoppers on a Saturday afternoon. It’s market day and with the stalls there’s less space than usual, but this is as busy as Lancaster gets. Flo chats away. 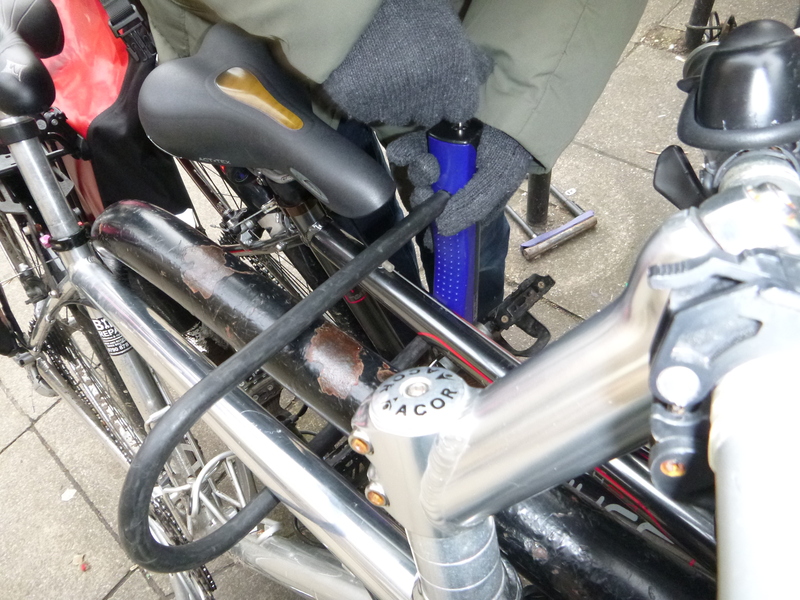 They reach the cycle parking stands outside the city library and Sue locks their bikes there. I leave them here. As I said, they’ll continue through town to a supermarket, and then back home. It’s just an ordinary bicycle journey. City cycling. And so is this, a book about city cycling, called ‘City Cycling’. 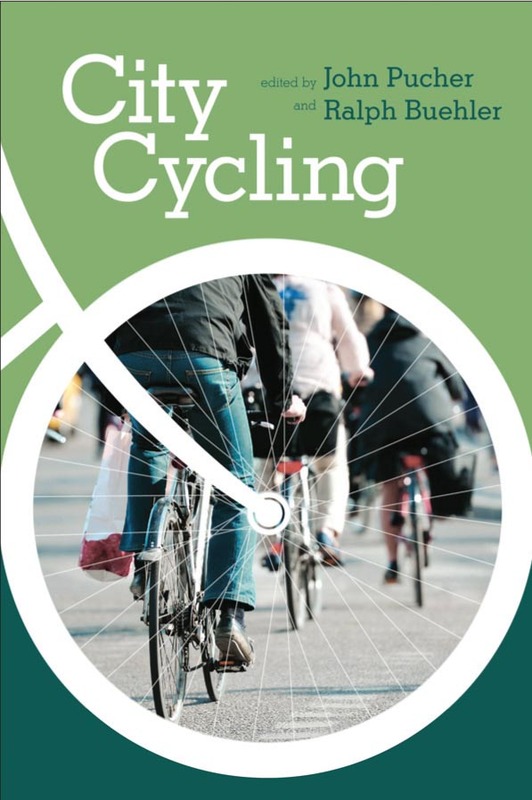 Recently published, it tracks the supposed renaissance of city cycling, and advocates for more. It’s co-editors, chief contributors, and guiding forces are John Pucher and Ralph Buehler. They, and Professor Pucher in particular, have been relentless champions of everyday cycling. For over a decade their work has compared and contrasted the cycling situation in North America and Australia with the cycling situation in the Netherlands, Denmark and Germany. In doing so they illuminate what the former can learn from the latter, to make city cycling normal. This book continues that project, using a wider cast of contributors. I’m writing a detailed review of it for the next issue of the journal, World Transport Policy and Practice. I won’t rehearse here what I’ll say there, but I will note two things which struck me as I read it. First, it’s an important and hopefully influential achievement to pull together in one place state-of-the-art thinking, based on actual practice, about how to make cycling mainstream. It has academic credibility but the book’s heart is clearly advocacy; and I hope it’ll be widely read, and acted upon, by politicians, policy-makers and practitioners. This book contains all the knowledge necessary to make the kind of journey taken by Sue and Flo yesterday the norm across towns and cities everywhere. But second, I struggled with the book because it makes cycling seem so boring. Although strange and unsettling, this is a significant accomplishment. The effect built, chapter on chapter, is that city cycling is and/or ought to be nothing special. Humdrum. Like Sue and Flo’s little trip. As I say, this is an accomplishment, and a compliment not a criticism. But I find it disquieting. Does cycling inevitably become less interesting as it becomes more normal? Or is it, rather, advocacy that strips cycling of its (more interesting) meanings, or at least denies those meanings for a ‘greater cause’? The book leaves me with a feeling similar to one I get when discussing cycling with Dutch or Danish academics and advocates for whom cycling is much more ordinary. For them, thinking about cycling correspondingly seems a largely technocratic exercise, about planning and providing effectively. Cycling’s richness gets lost in the business of getting more bums on saddles. 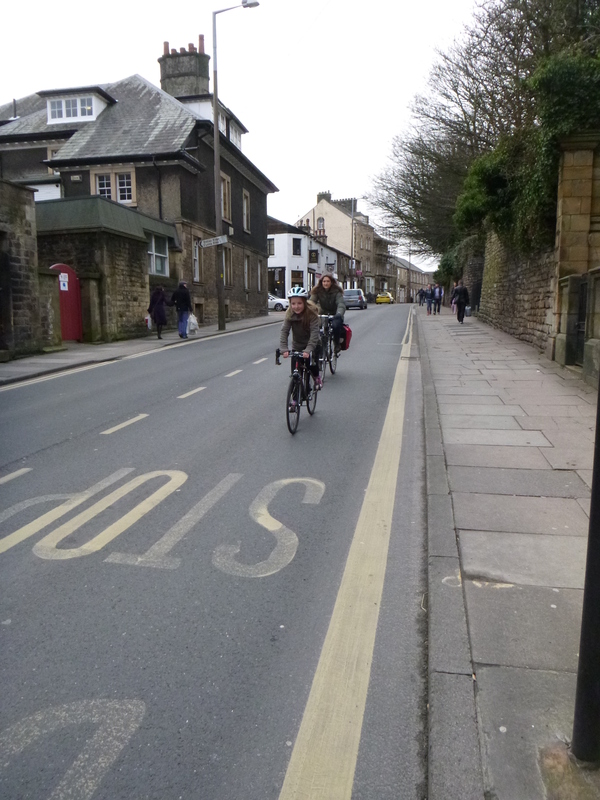 But if more bums on saddles makes city cycling boring, the sooner we make city cycling boring the better. Bring on boring city cycling!